It’s an all-out boys vs. girls prank war in this hilarious summer camp novel from the author of The Classy Crooks Club! Izzy Cervantes and her best friend, Mackenzie, have spent summers together at Camp Sweetwater since they were eight. So when their parents decide to ship them off to Camp Foxtail instead, the girls find themselves completely out of their element—and worse yet, in different cabins! Izzy feels like an outsider in Willow Lodge. 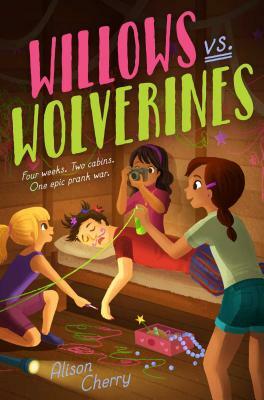 But when she hears about the time-honored prank war between the Willows and the Wolverines, the rival boy cabin, she sees a chance to make her mark. Convinced the girls will never accept her as one of them unless she has roots at Camp Foxtail, she boasts that her older brother is the most respected prankster in the camp’s history and would be happy to help them win the war. In reality, Izzy doesn’t even have an older brother, but the Willows embrace her as their new secret weapon, and Mackenzie agrees to help her hatch a series of epic stunts. As the hijinks escalate, so does Izzy’s popularity. But she becomes so focused on impressing her new friends that she starts neglecting Mackenzie, putting her friendship and her secret prank-master identity in serious jeopardy. Can Izzy keep the truth under wraps and win her best friend back, or will she end up on the wrong side of her allies as well as her enemies? Tween and young teen readers who have had their own summer camp experiences will enjoy this title and appreciate the inclusion of a strong Latina character.